Kettle Moraine Land Trust adopted Beulah Bog State Natural Area under the Adopt-A-Natural Area Program in 2009. Under this program KMLT has agreed to work with the Wisconsin DNR to restore and manage this very special State Natural Area. Beulah Bog lies in a series of four kettle holes and features an undisturbed bog with many unusual plants more typical of northern bogs. Classical stages of ecological succession are exhibited in the bog including: a shallow bog lake dominated by watershield with white and yellow water-lilies and extensive floating mud flats; an advancing, quaking sedge and sphagnum mat between 25 and 50 feet wide; northern wet forest of tamarack and bog shrubs and; a wet open moat surrounding the main bog, dominated by wild calla and cat-tails. Undisturbed bogs in this area are rare and the site supports a number of regionally rare plants that typically only grow further north in Wisconsin. 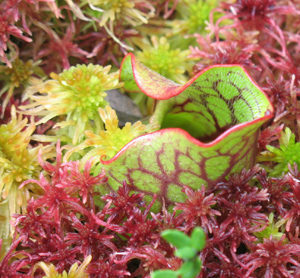 The site harbors at least six species of insectivorous plants like the one pictured to the right. The bog lake provides habitat for several dragonfly species and other invertebrates. If you would like to help us manage this critically important State Natural Area, join our volunteer stewardship team. No previous experience necessary. Beulah Bog State Natural Area is located north of East Troy. The Bog parking lot is located 0.8 miles south of County Highway J, on Stringers Bridge Rd.